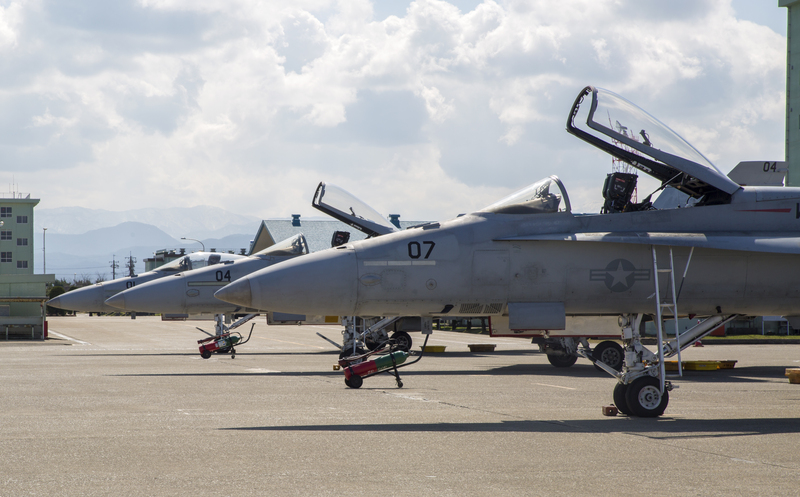 FA-18A++ Hornets with Marine Fighter Attack Squadron(VMFA) 314, forward based at Marine Corps Air Station Iwakuni, Japan, are lined up on the flightline at Komatsu Air Base, Japan, during the Komatsu Aviation Training Relocation exercise March 7-18, 2016. US Marine Corps photo. WASHINGTON, D.C. — The Senate and House armed services committees have agreed upon a compromise National Defense Authorization Act for Fiscal Year 2017 that prioritizes higher personnel and readiness levels over procurement of ships and aircraft. Senior armed services committee aides told reporters this afternoon that their compromise bill includes $3.2 billion in Overseas Contingency Operations (OCO) spending aimed at adding 16,000 soldiers, 4,000 airmen and 3,000 Marines to the force. That money covers not only the military personnel costs associated with the higher force but also increased operations and maintenance costs. “One of the things that we were really focused on was getting after the readiness issues,” an aide said. Marine and Navy aviation leaders have said that barriers to rebuilding readiness go beyond just funding for personnel and flight hours and also include a lack of spare parts to keep planes ready, a backlog of planes at depot maintenance facilities and other logistics and maintenance-related issues. The armed services committee aides said money was reallocated within the base budget, keeping within the Bipartisan Budget Agreement spending caps, to increase funding for aviation spares and maintenance to further help boost aviation readiness. To stay within the budget caps, though, procurement of aircraft, ships and other major platforms were trimmed back to the president’s budget request level, instead of the much higher levels the House Armed Services Committee had included in its version of the bill this spring. HASC had proposed a $20.6-billion shipbuilding budget for FY 2017, as compared to recent annual shipbuilding budgets closer to $15 billion, as well as funding for additional Boeing F/A-18E-F Super Hornets and Lockheed Martin F-35C Lighting II Joint Strike Fighters beyond the president’s request. Though the increase in personnel spending didn’t directly force the decrease in acquisition, the committee aides said there was a clear preference for people over platforms during negotiations. “Once you lose the end strength it’s a minimum of three years to get back to it,” an aide said. The compromise NDAA bill also splits the role of the Under Secretary of Defense for Acquisition, Technology and Logistics into two or three jobs – one to handle acquisition, one to handle development and innovation, and potentially a third to manage the defense agencies. The aides described the ideal acquisition environment as low-risk and disciplined, whereas the research and development community needs freedom to innovate and experiment and make informed risks – which require two different types of leaders to be most effective. The Defense Department would have a year to reorganize itself, giving the incoming Trump administration time to appoint Defense officials and make decisions about how the two new under secretary offices would look. The compromise bill language should be released tomorrow, with the bill going to the House Rules Committee then and hopefully on to the House floor for a vote on Friday. If passed, the bill would then go to the Senate for consideration next week.